The Sebring race, which was capped at eight hours, on the 6.02-kilometer circuit ran without incident over long stretches for Bruni and Lietz. Thanks to flawless drives, good tactics, and perfect teamwork, the No. 91 Porsche 911 RSR was running in second place. 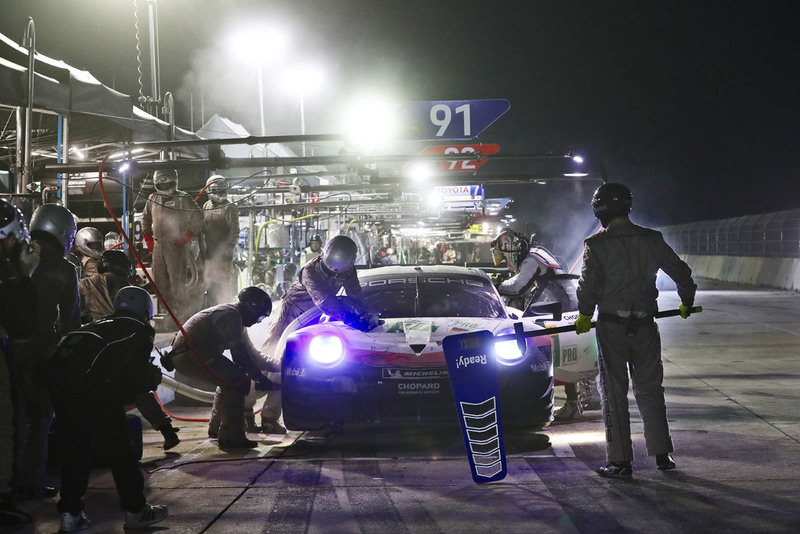 When the rain set in about 25 minutes before the finish, making an additional pit stop necessary, the Manthey-Racing factory crew did a perfect job and ensured that the car driven by Bruni and Lietz moved into the lead. With this, the winning driver squad has improved their ranking in the championship and moved up to second place. Their world-championship-leading teammates experienced a race of mixed fortunes. Estre was unable to defend his pole position after the start, collided with an opponent in the ensuing chase and was thrown far down the field by a stop-and-go penalty. The few overtaking maneuvers possible on this infamously bumpy track hampered him from catching the leading pack. Rain in the closing phase did not change this situation. In the GTE-Am category, the Dempsey Proton Racing team celebrated another win. Porsche Young Professional Matt Campbell (Australia), Porsche Junior Julien Andlauer (France) and Christian Ried (Germany) were rewarded for their consistent and flawless drive with first place. The Porsche customer team Project 1 with works drivers Jörg Bergmeister (Germany), the American Patrick Lindsey and Egidio Perfetti (Norway) secured third place at the Sebring race to defend their position in the overall classification. Gulf Racing with Porsche Junior Thomas Preining (Austria) and the two British racing drivers Ben Barker and Michael Wainwright achieved fourth. The No. 88 car fielded by Dempsey Proton Racing driven by Porsche Young Professional Matteo Cairoli (Italy) and his compatriots Giorgio Roda and Gianluca Roda concluded the race in seventh place. ← Previous High-tech soft top for the new Porsche 911 Carrera Cabriolet.